This post on time management comes from our marketing intern, Kayla Snyder. 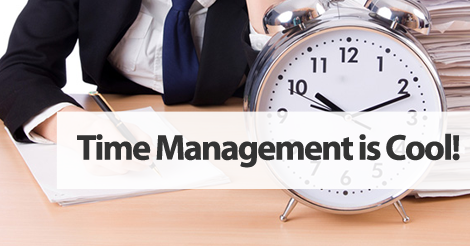 Time management is often overlooked by many, but it can have a big impact on how successful you are in your workplace. These 5 time management skills will make your day less stressful and more successful. Everything isn’t an important “need to be done” project. There are some to do’s that take a back burner to others. By prioritizing, you’re completing the most important tasks first. There are several different ways to prioritize. Sort your tasks by due date, or the time each takes to complete. I personally like to get the longest to do’s over with first. Take advantage of short bursts of energy. It’s no secret. There are points in the day when you’ll have more energy than others. You should take advantage of this energy and do your most important tasks at this time. It will make a longer to do you’ve been dreading seem way easier. After you complete an important task it will boost your confidence, leaving you ready to conquer the rest of your list. Make a short and specific to do list. This is the first thing you should do when you arrive to work. Making a list of your to do’s ensures you won’t forget or be late on any tasks throughout your day. This also helps prioritize your most important tasks for the day ahead, and recognize the ways you can use multitasking to proceed through your busy day with ease. Some jobs are highly influenced by emails and phone calls, but to others they aren’t a necessity. If your phone calls or emails don’t have to be answered right away, take advantage of this. A lot of people spend their days consumed by answering the phone or responding to emails. This distracts them from completing their work. If this is you, shut your phone and email notifications off when you get to work. Check your email and phone in the morning, around lunch, and before you leave. This allows you to complete your work faster while still responding in a timely manner. Do you have a hard time staying focused? Clear your desk. When there are piles, papers, and random objects all over your desk these often become distracting. Having just what you’re working on at on your desk will make it much easier to focus. These might seem like simple fixes, but when combined, they’ll have you leaving work confident and stress free.